Today my hubby took a turn hanging out with Momma so that I could get away for a few hours to take my second Chinese watercolor lesson. Truth be told, it was much more than a painting lesson. Much, much more. Judy, my teacher and special friend, would tell you that I’m a natural. I’m not as convinced, but I do love it, and am enjoying the emerging floral wanna-be masterpiece. We have several more hours of work on this painting. I say “we” because this has been a joint-effort. Judy shows me how to do something, then lets me do it myself. Then, her masterful hand and eye go over the painting and she makes improvements, then lets me continue with the improvements. And so on. My wanna-be masterpiece in progress. A daylily, of course! At one point, Judy was showing me how to outline the petals of my flower with a darker shade. As I watched her careful hand at work adding the dark strokes, tears streamed down my face. Darker strokes are necessary to bring out the light and to add dimension…to define. They bring a quiet beauty to the piece. After I dabbed away the tears, I shared with Judy why I was crying. It wasn’t because I was sad. It was just that I knew that each and every time I admire my painting in the future, I will see my sister in Christ’s masterful hand and the love behind it in my time of ‘dark strokes’ in life. As we talked, the subject of my blog came up. 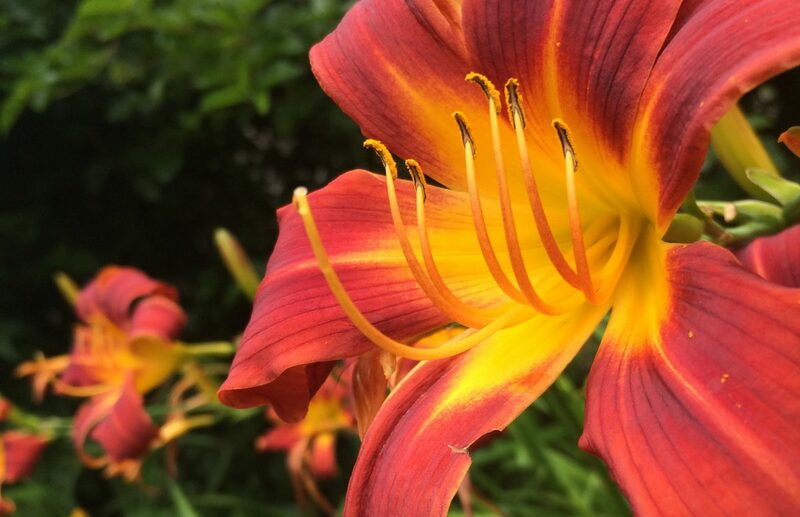 Judy and I are both enamored with daylilies, so she looked with favor upon my coral colored beauty on my blog’s header. Then, she pointed to my tagline. “Can we lose this?” she said, as her slender finger gently underlined the words “Before I Forget”. To her it seemed as those I was hinting and speaking of something ominous, a fear that I, too, would succumb someday to the dreaded memory robber, Alzheimer’s. I told her that it was purposeful. That I do understand that I am at a higher risk for memory loss. I am concerned that someday my family will need to decide how to take care of me. Each and every time I forget something, or don’t understand something, I fear “it” is coming to get me. I want any readers that may choose to follow me to know that. But, I also want them to see that, while I am helping my mother on this difficult and shadowy part of life’s journey, life goes on. For me, there is joy yet to be discovered in gardens, the love of family, and in serving my Lord and Savior. God is good. All the time. ALL the time.